There’s a storm coming and it’s called Just Cause 4. The next open-world South American explode-’em-up from Avalanche Studios is out tomorrow, December 4. But the review embargo for Rico’s next adventure is today and you know what that means? Lots of review scores to help inform your purchase of the game. If you don’t know what a Just Cause 4 is then you need not worry as it’s easy to summarise. You play a renegade called Rico who’s armed with tools that can lift cows into the air, conduct tornadoes to his will, and tie cars together with a cable so that they crash in spectacular fashion. It’s a game about causing as much chaos as possible and it’s all done in order to bring down a despicable despot who’s terrorising the people and their land. That’s the summary of most Just Cause games and the familiarity of that mission is something critics have dwelt upon in their reviews. The problem for some is that this new Just Cause game isn’t different enough from the previous ones – as fun as it can be, we’ve been in this playground before. For that reason, the game has ended up with a OpenCritic average of 73 and a Metacritic average of 76 – at the time of writing, that is. Mostly good, then. By no means is this a bad game but it seems that if you’ve played a Just Cause game before you shouldn’t expect something completely new and refreshing. 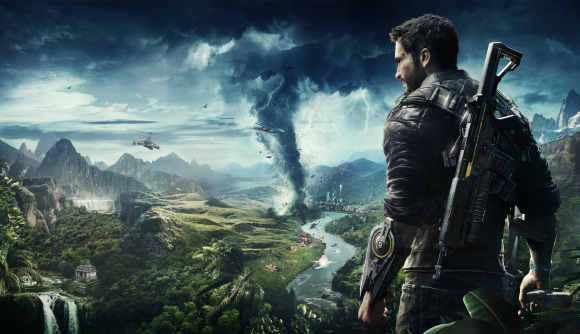 However, if you haven’t played one before and want some totally ballsy open-world chaos then dive right in – likewise, if you want more of the same, Just Cause 4 is yours for the taking.